Marc Marquez was again the fastest rider in the MotoGP Warm Up practice previous to the Grand Prix of Argentina’s race that will take part in the Termas de Rio Hondo track. Jorge Lorenzo took the early lead of the timesheets, followed by Stefan Bradl and Aleix Espargaro. But Marc Marquez climbed to the first place with 10 minutes to go. The World Champion improved his own time the following lap and showed he is the main candidate for the win this afternoon. Lorenzo tried to get closer to Marquez’s time, but he only could set a time that was six tenths off the Honda rider. Valentino Rossi went third quickest with two minutes left on the clock. Many riders were improving their personal times in the closing stages of the practice. Dani Pedrosa went up to fourth place with his best lap of the session and Aleix Espargaro climbed to second in his last lap. 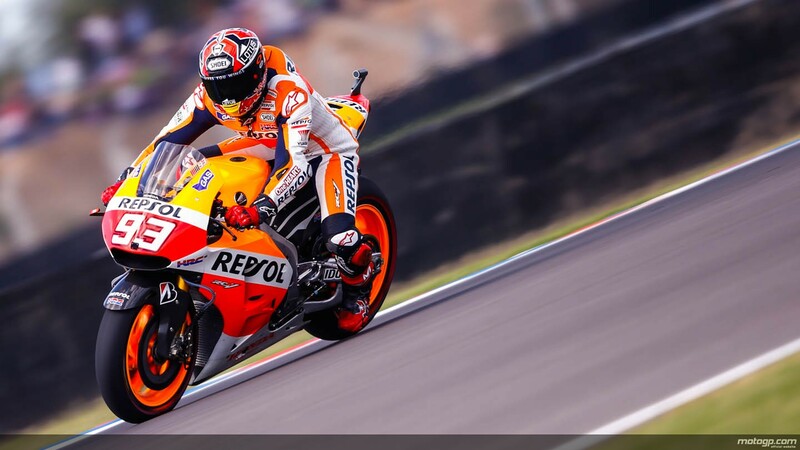 No one could beat the time of 1:38.898 that was set by Marquez, who finished another session on top of the results. Espargaro was second, followed by Lorenzo, Rossi and Pedrosa in the top five.